Trading places: Steve Jude, chief executive of serviced office group Citibase, can often be found in his company’s Birmingham office, an old converted draper’s warehouse in the heart of the Mailbox district. But how would he fare in the thick of his central sales team? Here he reveals how he got on going back to the floor. “Marcus, how much is that 12 we’ve got available in Brighton right now?” Declan is halfway done hollering from the other end of the room as I stride into our Mailbox office. He respectfully knows not to shut-up just because I’ve appeared again. 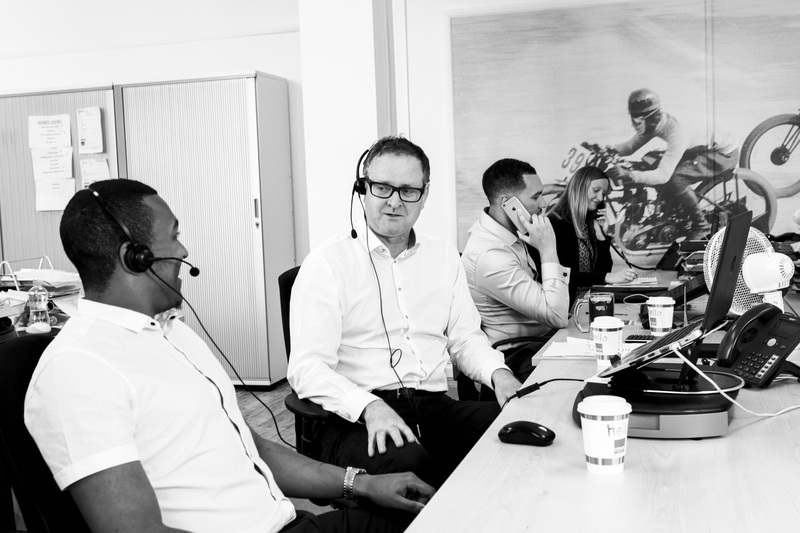 I try and work one or two days a week from our Birmingham hub – and I’m always drawn to the buzz of our central sales team. Often I’ll make a beeline for the open plan workspace, within earshot of the patter. I enjoy listening to Marcus and the team and working out who’s asking what on the other end of the line. Today is a touch different. I’m going to don a headset, buddy-up and muscle in. Reece has drawn the short straw to shadow me but, as is typical of the guy, he seems unperturbed by it all. “Ready?” It’s deliberately as cheeky as it is rhetorical, his implication being I might have lost my touch. But then I always did like proving people wrong – and I’ve been looking forward to this. My time is mostly spent convincing building owners and landlords of the benefits of working with us, to convert their under-utilised office space into a cash-generating business centre. Today I’ll be at the other side of our end-to-end process, finding and bringing in businesses to fill it for them. Gladly I’m not someone who’s retreated so far into the board room I’ve forgotten what it’s like on the frontline. I often talk about the ‘Citibase Engine’ – a moniker for that end-to-end business process that is so appealing to our building owner clients – and this is the engine room. It’s a line I proudly try out on the team but may as well have proffered the punchline myself. The opportunity for a ‘fossil-fuelled’ quip isn’t lost on those of less years poking fun at me. But then they don’t lack experience either. Chris, our Director of Sales, has been here five years. Becky, our Reservations Centre Manager, who I can only describe as a superstar, has been part of our family for three. It’s their engine room in truth – and it’s been rocket fuelled of late. Over Chris’s shoulder a whiteboard bears excitedly scribbled evidence of a counterintuitive fact: we’ve just set a new record for sales. Yes, for all the uncertainty surrounding Brexit, right there in red marker he’s charted the biggest monthly figures by volume and contracted revenue. Ever. I challenge him on it for a rise, “is it upside down?” “It’s like we keep telling them boss, feel free to be as uncertain as you like for three months, because there are deals to be done”. ‘Freedom at work’ isn’t just our own plucky manifesto pledge, though it does look good in magenta. It’s what the world of work demands. Ignore that and you’ll be proved wrong, too. I have Becky bet me one thing my first caller will list as a must. “Flexibility,” she fires back with a disarming smile. “It’s like most men; they’re just not up for long-term commitment too soon”. It’s not just the little guy either, albeit most of the calls we’re getting are SMEs 1-20 strong. The next couple come from a start-up and a small family law firm. The one Marcus took earlier was from an East Sussex accountant. Demand for office space is on the up from cost-conscious SMEs in all sectors. And if variety is the spice of life, flexibility is the flavour not only of our record month but of the changing world of work. Chris, Becky and the team, they all know it too, because they’re handling more and more calls like these day in, day out. It’s a point I’ll take back to my discussions with building owners and landlords. Because those sitting empty hoping someone comes knocking for a long lease will likely be waiting a very long time. You have to wonder why, when our central sales team of 15 are handling 5.3 million sq. ft. of demand every year. Admittedly I didn’t quite hit that mark, and I’m entirely happy returning to eavesdropping instead. Besides, back in our open plan office I can also hear our finance team talking contracts and cash. On the wall overhead is a giant graphic of a vault door and they play as big a part in putting money in the bank. Last year that equated to £5 million of new business. Crucially, we made £8 million for landlords and building owners at the same time – a tenfold increase in just seven years. That’s the Citibase Engine at work. And I can watch it all within reach of the coffee machine.